What is cannabis hyperemesis syndrome? Is it a cannabis bad trip? Is there such a thing as chs weed or chs marijuana? Many people have questions about CHS cannabinoid hyperemesis syndrome, as this syndrome has been reported in the media numerous times over the past few years. This is a very rare syndrome that occurs in long-term heavy users of THC-rich cannabis. CHS was first reported in the medical literature in 2004. Symptoms include nausea, vomiting and abdominal pain. CHS is also known as cannabis vomiting syndrome. Many people suffering from CHS will seek help at the ER and because they are reluctant to tell the doctor about their cannabis use, they go undiagnosed. However, this is changing as cannabis becomes legal in more states. Abstinence from THC-rich cannabis resolves the condition. Some CHS sufferers are able to re-introduce THC in very low doses without a return of symptoms, but other find that they can no longer tolerate THC. While there is no ‘chs weed’ per se, it is unknown why some cannabis users experience hyperemesis syndrome. It has been theorized that overuse of THC can make some people’s cannabinoid receptors act paradoxically (opposite) of how they are supposed to act. For example, we know that THC is quite effective for stopping nausea and vomiting because THC binds to the receptors on cells located in the part of the brain that control these symptoms. Once THC binds to the receptor, a chemical reaction takes place, telling the cells to stop sending the nausea/vomiting message. But in CHS, THC causes the opposite effect, increasing nausea and vomiting. It’s likely that some people are predisposed to this paradoxical reaction because only a very small percentage of people who overuse THC get cannabis hyperemesis syndrome. Marijuana is the dried leaves, flowers, stems, and seeds from the cannabis sativa cannabis indica plant. Hashish, oils and other products are made from the concentrated resins of the cannabis flower. Marijuana has several active substances. These include tetrahydrocannabinol (THC) and related chemicals. These bind to molecules found in the brain. That causes the drug “high” and other effects that users feel. Your digestive tract also has a number of molecules that bind to THC and related substances. So marijuana also affects the digestive tract. For example, the drug can alter the time it takes the stomach to empty. It also affects the esophageal sphincter. That’s the tight band of muscle that opens and closes to let food from the esophagus into the stomach. Long-term use can change the way the affected molecules respond and lead to the symptoms of CHS from marijuana. What causes cannabinoid hyperemesis syndrome (which is also known as cannabis vomiting syndrome)? Marijuana has very complex effects on the body. Experts are still trying to learn exactly how it causes CHS syndrome in some people. In the brain, marijuana has the opposite effect of CHS. It helps prevent nausea and vomiting. The drug is also good at stopping such symptoms in people having chemotherapy. In the digestive tract, marijuana seems to have the opposite effect. It actually makes you more likely to have nausea and vomiting. With first use, the signals from the brain may be more important. That may lead to anti-nausea effects at first. But with repeated use of marijuana, certain receptors in the brain may stop responding to the drug in the same way. That may cause the repeated bouts of vomiting found in people with CHS. It still isn’t clear why some heavy marijuana users get the syndrome but others do not; as we said earlier, there isn’t a chs cannabis in specific. People with CHS suffer from repeated bouts of vomiting. In between these episodes are times without any symptoms. Healthcare providers usually divide these symptoms into 3 stages. They are the prodromal phase, the hyperemetic phase, and the recovery phase. During the prodromal phase, the main symptoms are usually early morning nausea and belly (abdominal) pain. Some people also develop a fear of vomiting. Most people keep normal eating patterns during this time. Some people use more marijuana because they think it will help stop the nausea. This phase may last for months to years. During this phase, the cannabis vomiting is often intense and overwhelming. Many people take a lot of hot showers during the day. They find that doing so eases their nausea. 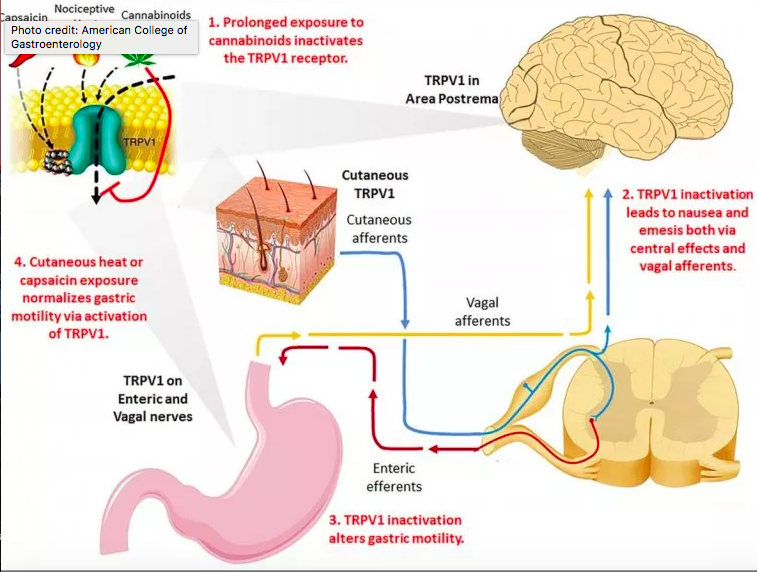 This may be because of the affects of the hot temperature on a part of the brain called the hypothalamus, which controls both temperature regulation and vomiting. People often first seek medical care during this phase. Many health problems can cause repeated vomiting. To make a diagnosis, your healthcare provider will ask you about your symptoms and your past health. He or she will also do a physical exam, including an exam of your abdomen. Cannabis hyperemesis syndrome was only recently discovered, so some healthcare providers may not know about it. As a result, they may fail to spot it for many years. They often confuse CHS with cyclical vomiting disorder. It’s a health problem that causes similar symptoms but doesn’t respond to the hot shower or warm bath – a gastroenterologist might make the diagnosis. Symptoms often ease after a day or two unless marijuana is used before this time. To fully recover, you need to stop using marijuana all together. Some people may get help from drug rehabilitation programs to help them quit. Cognitive behavioral therapy or family therapy can also help. If you stop using marijuana, your symptoms should not come back. What are the complications of cannabinoid hyperemesis syndrome? You can prevent CHS by not using marijuana in any form. You may be reluctant to believe that marijuana might be the underlying cause of your symptoms. That may be because you have used it for many years without having any problems. The syndrome may take several years to develop. The drug may help prevent nausea in new users who don’t use it often. But people with CHS need to completely quit using it. If they don’t, their symptoms will likely come back. Some people with the syndrome may not be diagnosed for several years. Admitting to your healthcare provider that you use marijuana daily can significantly speed up the diagnosis and possibly avoid many invasive and expensive tests. Symptoms start to go away within a day or two after stopping marijuana use. In people with CHS, symptoms almost always come back if they use the drug again.